The astonishing thing about the Europe's response to the ongoing refugee crisis is that it has been almost wholly passive. The debates have centred on the number of people to be let into various countries and how the total should be distributed throughout the 28 member states of the EU. This passive response, and the reluctance to seriously discuss action to address the root of the crisis: the Syrian Civil War, is indicative of the malaise that has eaten deep into the influence of the Great Powers of Europe. By abandoning responsibility for what goes on in areas that could be described as Europe's "back yard", North Africa and the Eastern Mediterranean, the great powers have contributed in no small measure to the deterioration of the situation in Syria and Libya. Military adventures in Iraq and Afghanistan have sapped any will for the introduction of ground troops into either conflict, even the idea of muscular peacekeeping forces under a UN flag hasn't been seriously mooted. All of this is a sign, in the author's opinion, of the abrogation of responsibility by European states for their own foreign policy. 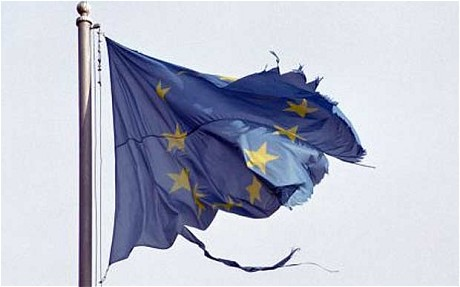 Increasingly the nations of Europe look to the EU to manage their foreign policy, a body neither equipped nor designed for the purpose. When an issue is too large for the EU to manage, or when military action has been required, all eyes turn to the United States to provide the leadership and resolve to "sort out" a problem. What we're seeing today is a situation where a self-interested and increasingly reluctant United States has refused to take the lead in solving a problem which effects them very little, and which is beginning to effect Europe a great deal. The American response has been almost entirely focused on defeating ISIS in Iraq by bombing. Hardly a solution to the Civil War in Syria. The sad message of the story seems to be that when everyone believes they're protected by a collective organisations like the EU and NATO they take less responsibility for the defence of their own interests. This has happened to such a great extent in Europe the great continental powers have become strikingly passive international actors. 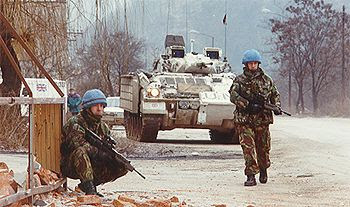 It was not always so, throughout the 1990s the major European powers took an active role in containing and eventually bringing to an end the war in the Balkans. Few should forget that at its worst that conflict was fought by groups just as ruthless as the jihadists of Syria or the militias of Libya. And yet now, we don't even seriously discuss intervention. The cancer of "someone else will sort it out" and "it's not our problem" has spread far, reducing states with the ability and capacity to act to mere onlookers. The fact that Europe accepts refugees is not concerning, what is worrying is that this is our main contribution and the subject of the whole debate. At least Britain is one of the more involved states, trying to make a difference where it will count. The capitals of Europe should be ashamed that the UK has contributed more in aid to the people of Syria than all of them combined. While supporting US bombing of ISIS targets in Syria, through refuelling and intelligence missions in the region, is a feeble military commitment it's far more than the other great powers will even contemplate. At least the UK is willing to do something rather than stand aside and do nothing at all. Regardless of whether we, as Europeans, want to be involved with these problems or not we don't have a choice in the matter. Either we are willing and able to go to the crisis, or sooner or later the crisis will come to us. We can no longer pretend that the EU can provide all the solutions to the serious international problems we face today. Nor can we continue to depend to such an unhealthy degree upon the largesse of the United States to pay the price in blood and treasure for maintaining stability in our geographic backyard. If this means spending more on the tools of foreign policy: aid, diplomatic services and defence then so be it. There is increasingly little choice in the matter, lest we are left as passive spectators in our own retreat into irrelevance. A man of great standing once vocalised a similar feeling to the one that currently exists amongst most of the peoples of Europe when he said: "How horrible, fantastic, incredible it is that we should be digging trenches and trying on gas-masks here because of a quarrel in a far away country between people of whom we know nothing." The man was Prime Minister Neville Chamberlain and the "far away country" was Czechoslovakia. 2015 is not 1938, but when we turn our backs on the world and "only wish to be left alone" the world has a tendency of coming knocking. Like every generation that has come before us we must constantly learn and relearn the vital value of action and the bankruptcy of trying to be a passive bystander on the world stage.